Elf Defense is a refreshing new tower defense game from Jellyoasis for the iPhone and iPod touch which also runs on the iPad in HD as a universal app. I’ve played a ton of TD games on the iOS and have never seen anything like Elf Defense before. With Elf Defense, Jellyoasis has added all the pieces for a successful tower defense game with endless details that make the game a joy to play. The hi-res environments are beautiful and characters use a 3D boxy design which is brilliant and more polished and sophisticated in comparison to Minigore for example. 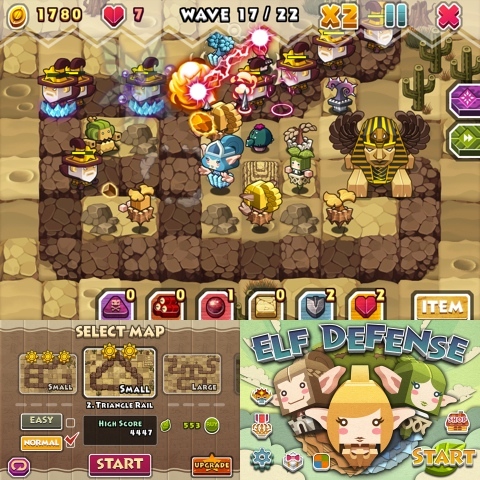 As for its addictive quality, Elf Defense is a lot like Plants vs. Zombies. The upgrade system is extremely elaborate and narratives tell the story of the elves throughout the game. Gameplay is fun and super addictive as you would expect, with a lot of variety and excitement from one level to the next. If you’ve been looking for a good new tower defense game to eat up your free time, Elf Defense is the one and well worth the $3 price tag. This is so far the TD game of 2012! Themes and Levels – Elf Defense comes with 6 themes with 10 levels each. Each theme is starts with its own story, and is packed with new characters, enemies and has its own design and color scheme. Levels can be either Small, Large, or Middle (aka Medium) in size. Enemy waves can attack from either 1 or 2 points at a time. Enemy waves move along stone paths laid out using square blocks. The maps are adorned with amazing landscapes, everything form plush grass to lilly ponds and sand deserts. Some blocks can not be used as they are blocked with a stone or rock. You can use a shovel to clear the stones, which is one of the many items you can earn and use in the game. A Star rating of 1-3 is assigned after each level depending on your performance. Enemies – There are over 100 enemies in this game, so you won’t get bored anytime soon. Again I have to praise the amazingly detailed graphics and design here. Everything is fully fleshed out from weapons to animated movements and even facial expressions. Units, Items and Mercenaries – Tap to place one of 6 tower units which you gain as you proceed throughout the levels. You can add new towers which are paid for using golden seeds. Each level starts with 40 golden seeds which you gain by killing enemies. You can upgrade this starting amount using holy leaves. Holy Leaves are earned for completing each level and vary depending on your achieved star rating. Speaking of Holy Leaves, you can also hire and use special items, each know as a Mercenary, which holy leaves. Samson – Throws stones. Starting cost is 10 golden seeds. Icer – Casts ice to slow enemies down. Starting cost 35 golden seeds. Sharpshooter – Hits flying enemies with an arrow. Mercenary Types – Special friends that will really help you kill enemies. You gain them along the way for free and you can also hire them. Other features include multiple difficulty levels, GameCenter integration, and a built in shop for upgrades. You can also buy upgrades via in-app purchases if you want to “cheat” and get through the game much faster. The soundtrack music is engaging and sound effects are subtle and on point. There was initially a bug in the game that would not let users get past the first level in the desert theme. Thankfully the developers have just released an update that fixes that issue which goes to show they’ll be supporting this app going forward. The only thing I have noticed that could potentially be an issue now is that selecting items and spaces can be tricky in the corners of the map, especially on the iPhone. Some TD games offer a pinch to zoom feature which is missing in Elf Defense, and could be one way to address the problem. Besides that one minor complaint, this is pretty much a 5 star app. If you have an iPad 2, you will also be able to fully appreciate the HD graphics on the larger screen. 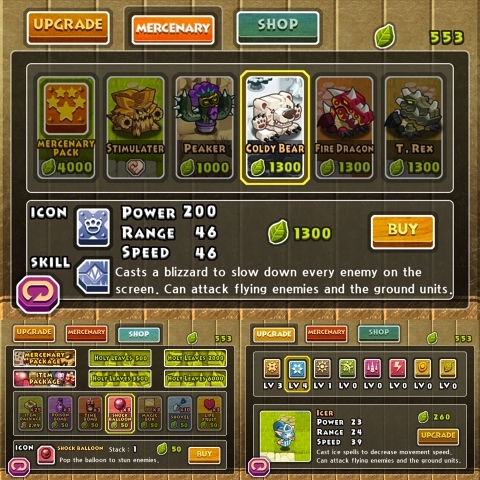 AppSafari review of Elf Defense Eng was written by Joe Seifi on February 11th, 2012 and categorized under App Store, Featured, Games, iPad apps, Strategy, Tower Defense, Universal. Page viewed 7019 times, 1 so far today. Need help on using these apps? Please read the Help Page. I owe an iPad and this is one of the games that I really like to play on it ! !